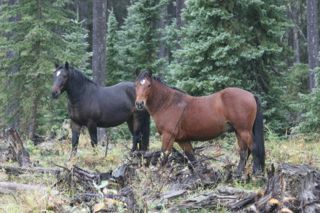 Summer is gone and the colours of fall have descended on the landscape in wild horse country. There has been an abundance of moisture all summer which has allowed the grass to grow and grow. The wild horses took advantage of this to build up their body reserves and all the horses we’ve come across are in excellent condition. 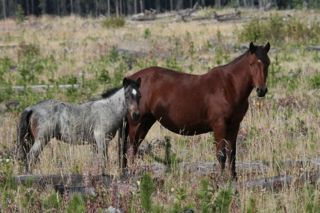 The foals that have survived have grown strong and are doing quite well. 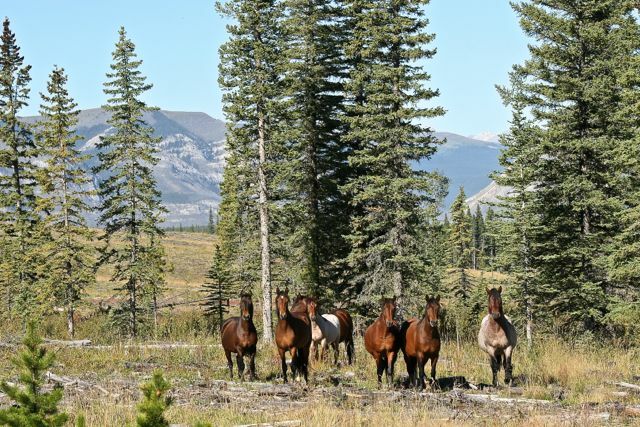 One thing though that has been noticed by ourselves and others is that several herds do not have any foals and there are very few yearlings to be found. 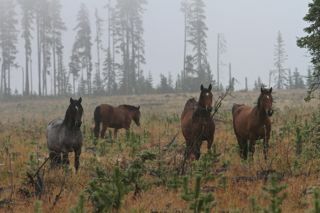 This is due to the hardships that the horses had to endure last winter. We can only hope that Mother Nature is not so harsh this year. These two young boys, like the rest of the wild horses, are using this time of year to build up their body condition for the winter that is yet to come. Not only are the horses using this time of year to prepare for winter, so are other wildlife that inhabit the eastern slopes. 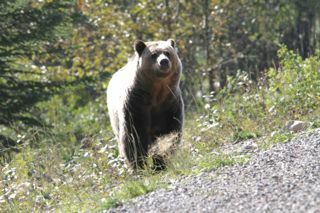 We have seen more grizzly bear this year than ever before and like this young 2 year old, they are all busy foraging for food. 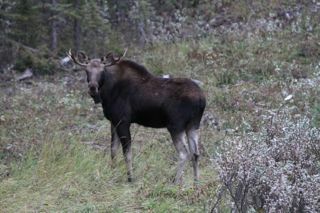 The moose, too, are taking advantage of the succulent leaves that are still on the trees. Until the cooler weather does come, this time of year flies can cause a lot of distress to the horses and other wildlife. As with these three, the flies cover their faces and get in their nostrils and ears causing them some aggravation. The horses, therefore, are constantly on the move or standing closely together to allow the tails of the other horses to fend off these annoying bugs. 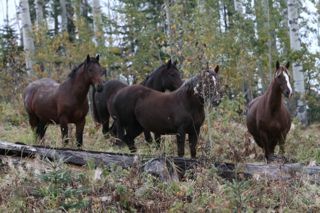 As fall progresses, so does WHOAS in moving forward with our proposals to assist in wild horse population management. We are still in negotiations with the ESRD who has responded so positively to our initiatives. As stated in previous blogs, it is our sincere belief that working in mutual cooperation with the ESRD and other stakeholders that we can assure a positive outcome for the wild horses. In regards to the adoption plan and rescue facility, we have secured through a generous donation a parcel of land which we will develop. We have purchased proper panels and other equipment to this end. This proper equipment will assure that any horses we take in, as in this past summer, can be safely, securely and humanely handled. It will also assure the safely of the WHOAS volunteers that we will need, when it comes to working these truly wild animals. We have spent a large amount of our funds to get this up and running and we hope to have it in operation by the end of October. As far as the PZP contraception initiative, as stated we are still in negotiations to get this properly put in place. We have gathered a team of volunteers and other professional people to assist us as we move forward. Using the expertise of this group, WHOAS will assure that this plan can and will work strictly for the benefit of the wild horses. Moving forward we have also used our funds to purchase some of the required equipment necessary. Whenever everything is in place and ratified by all parties involved, we will be making an official announcement to advise our supporters and the general public. Until then, we will keep working, as we always have, to our longterm goal of having the wild horses of Alberta better protected so that they will always remain on the landscape. 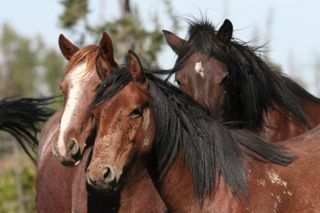 WHOAS appreciates all the donations made by individuals who believe in what we are doing and truly support the wild horses of Alberta. Our major fundraising effort which will be very important this year, to allow us to carry on this work, is our annual calendar. This will be available before the end of October and we hope for a successful campaign and that you will purchase one to help the horses.